Stems: Erect and arching to trailing, bearing stout, flattened, broad-based prickles. Leaves: Alternate, odd-pinnate; leaflets 5-11, egg-shaped or oblong, .8 to 1.6 inch long, glabrous above, usually downy beneath; margins toothed; tips blunt or pointed; stalks pubescent; stipules at base of leaf stalks deeply dissected, comb-like. Inflorescences: Few to many flowers in rounded or pyrimidal branched clusters. Flowers: Flowers .6 to 1 inch across; sepals 5, .25 to .4 inch long, glabrous or stalked-glandular; tips often tapering to slender points; petals 5, egg-shaped, .25 to .5 inch long, white or rarely pink; stamens numerous; styles united into column. Fruits: Achenes, about 1/6 inch long, yellowish, somewhat flattened; enclosed in a fleshy, spherical, red "hip". Habitat: Open woodlands, stream valleys, waste places, thickets, pastures, and along roads. Distribution: East half of Kansas. 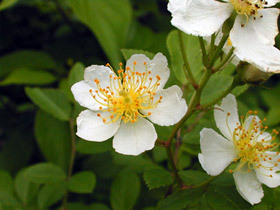 Origin: Multiflora rose was introduced from Asia. Naturalized in the U.S. Uses: It was formerly planted for wildlife cover and to serve as a barrier. It often escapes and becomes weedy.